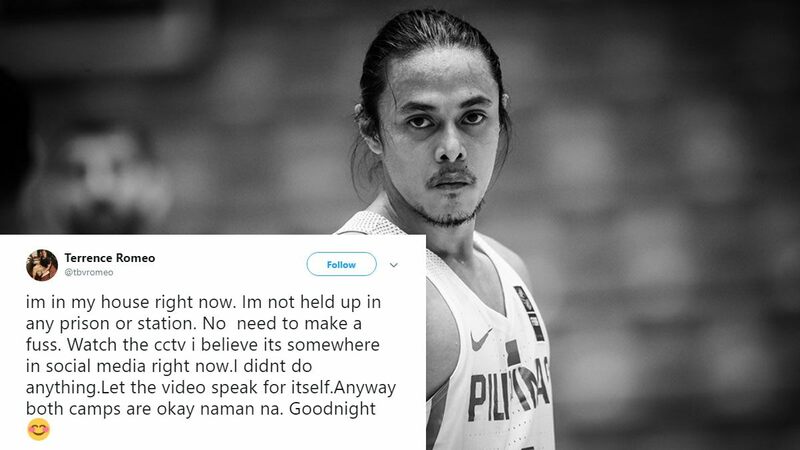 More than a week after that infamous FIBA basket-brawl, Terrence Romeo and his group got involved in another fight on Thursday—this time off the court and outside a bar in Quezon City. According to earlier reports, the skirmish may have stemmed from a fan asking for the PBA player's autograph. Said fan's wife shared in an interview with DZMM that they were just asking for another photo with Romeo when somebody punched her husband and chaos ensued. She added that the Gilas Pilipinas and TNT KaTropa member denied knowing the person who threw the first punch. When Romeo was sought for comments upon leaving QCPD's Station 10, he said, "Ito lang po sasabihin ko, check niyo na lang po yung CCTV, then pagkatapos niyo po i-check yung CCTV... tsaka niyo ako balikan." The CCTV footage eventually surfaced, and although the video is unclear, it's quite apparent that Terrence didn't start the commotion. "As you can see he was talking to (Brian) Heruela and was grabbed to his surprise. A fan/bystander was the one who beat the guy while Terrence was pushed aside," an anonymous source told SPIN.ph. Romeo later took to social media to clarify the incident and assured his followers the that the issue is now resolved. Still, his name made it among the local Twitter trending topics, with some netizens taking the Bro's side and others passing shallow judgment.